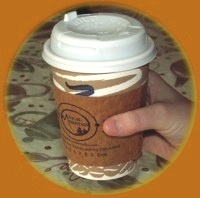 A coffee sleeve advertising campaign is a powerful way to reach potential customers. Local coffee cafe and restaurant patrons tend to conduct other business locally. They will go out of their way to support other local business. When you advertise on a coffee cup sleeve, your message is getting in front of people who would prefer to do business with you - if they had your information! the average recall of the information on the sleeve is 65%. As coffee cafe owners ourselves, we found that there is real power in local businesses working together. We've established an extremely effective method for establishments using cup sleeves to work with other local businesses to benefit each other. We match interested advertising partners - who utilize the back side of the sleeve for their marketing message - with a host business whose brand/logo appears on the front of the sleeve. We call it a MoJo Match - when businesses collaborate like this, real energy is created!